Available to all Lake Gaston Computer Club members, the Repair Center is open every Monday (except major holidays), from 8:30 A.M. until 2:30P.M. We are located in Suite C of the Town Center Complex on HWY 158 in Littleton, NC, the same location as our LGCC Classroom. We can be reached by phone at (252) 586-9919. When your computer system goes out of whack or you need instruction on how to make things work the way you want, this is the place to come for Lake Gaston computer repair service. For those "techy" problems we have a Tech Support Group that can fix most computer ills, remove viruses, clean malicious software, add more RAM, replace bad parts, install software or new operating systems, setup your new computer or even build you a custom computer. They specialize in cleaning up a slow system so that it will run faster. They are happy to give you some instruction or advice when you need a hand or just don't understand. If the problem can't be solved by the support group they will advise you as to the best course of action. You may contact Paul Bernard, Gus Best, Bill Kuhns, Barbara Dow or any of the others to make arrangements to bring your computer to the Repair Center or just show up on any day that they are open. They may even be able to help you over the phone or give an you an idea of what the problem is before bringing it in. Members should keep in mind that even though the folks working in the Repair Center are quite competent they are not computer professionals. They are just members who have experience in computer repair and are willing to help. There are no guarantees, of course, and members avail themselves of this service at their own risk. There is no charge except for parts however donations to the club are always welcomed. Friends are still often the first source of help. Club meetings offer an opportunity to make acquaintances who share one’s computer interests. Classes are offered both in lecture and hands-on modes to help members develop their computer skills. A volunteer group of technically skilled members man the club’s computer repair center from 8:30 a.m. to 2:30 p.m. on Mondays. When computer problems occur a club member can bring it to the shop where Tech Support personnel will do their best to fix it. They are usually successful and there is no charge for this service except for parts if needed. However, donations are welcomed and greatly appreciated. Responds to requests from local governments, schools, churches and nonprofit organizations with computer related help and education. Collects, refurbishes, and distributes computers to senior shut-ins, youths in need, schools and nonprofit organizations. Awards two $500 scholarships to local students attending a community college in our area. 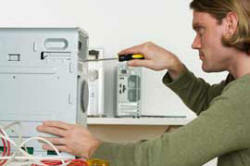 Professional help is sometimes needed, for instance when a member cannot bring the machine into the repair center, or when a member prefers not to wait till the next Monday, or the volunteer Tech Support Group is unable to resolve a problem, or when the machine is a business computer. In these cases professional services may be required. There are several Computer repair facilities in the local area, contact one of them for arrangements and cost estimates. If you have a computer to donate, a candidate or cause to recommend,CLICK HERE to send an e-mail to the chairperson of the Community Services Committee.